What a terrific week was held at Hereward with the annual 'Music Week' series of activites. It kicked off with an energetic assembly from 'RockSteady' demonstrating different rock band instruments with lots of singing along with the children. We also conducted 'The Big Sing' with each class working hard to learn a Disney song which they performed beautifully to the whole school in assemblies. Regan in Year 4 said, "I liked learning my song and singing to everyone in assembly." 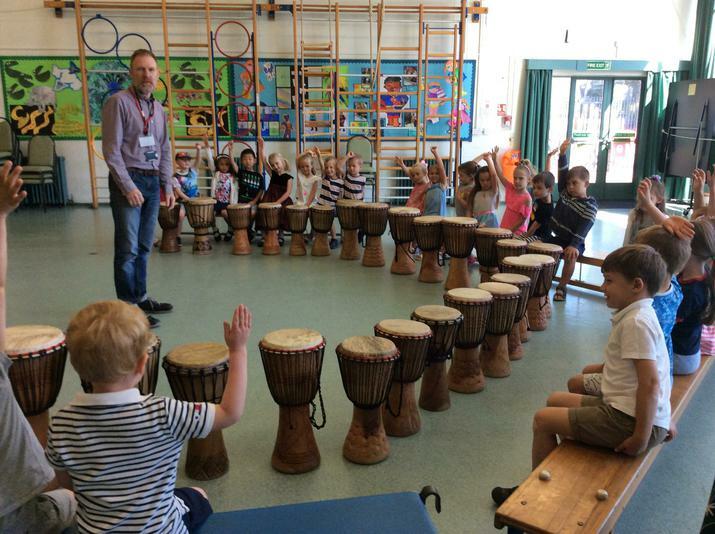 As well, the children in Reception to Year 3 got to participate in a Djembe drum workshop focussing on rhythm and pulse. Music Co-ordinator Miss Cadoux said, "What a fantastic week it was to promote music within our school. I was so impressed with everyone's singing during our 'Big Sing' and hope the week will help encourage a love of music in all our pupils." Children in each class performed a song as part of 'The Big Sing' during Music Week.